Suryodaya Hotel is a deluxe luxury hotel in Haridwar which does not make too much effort to make guests feel comfortable, it come naturally. Guests have turned to Suryodaya for quality service, distinctive cuisine and all round excellence. Suryodaya Hotel is the epitome of luxury and hospitality. Exquisite interiors, impeccable service, fine cuisine and contemporary technology come together to create an experience that is both grand and intimate. The hotel brings with itself a track record of providing first-class facilities and immaculate services to its guests. The staff at the hotel always sport a positive attitude and friendliness towards guests in Haridwar. 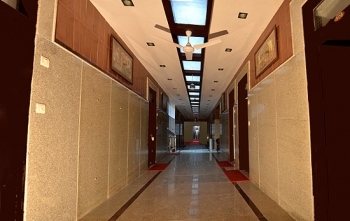 Hotel Suryodaya is located at Hari-Ki-Pauri, Haridwar (Uttaranchal, India), a stone throw away from the famous Ghat where evening aarti is conducted and right opposite the Safe Parking area and overlooking the River Ganga. The nearby tourist and pilgrimage centers from hotel Suryodaya in Haridwar are : Chandi Devi Temple (4 kms), Mansa Devi Temple (2 kms), Daksh Mahadev Temple (6 kms), Sapt Rishi Asharm (3 kms), Shanti Kunj (4 kms), Bharat Mata Mandir (3 kms), Neel Dhara Bird Sanctuary (14 kms), Chila National Park - Park Safaris (15 kms), Shivpuri (White water rafting) - 30 kms. Hotel Suryodaya offers the finest choices in first class accommodation with 28 well furnished AC rooms which includes Double Bed Ganga Facing, Double Bed Road Side, Three Bedded and Four Bedded. The rooms are extremely spacious and offer all modern facilities & services for a comfortable stay. Each room is equipped with first class facilities. All Rooms are by far the most spacious in the city. The deluxe rooms are spacious and well furnished with centrally air conditionining system and attached bath and shower. A meeting place for the exclusive people, in comfort and style. And prepare yourself for the exquisite Indian experience. Choose from a well appointed range of rooms. Tastefully decorated in pleasing shades and furniture. There is a Multi-Cusine Vegetarian restaurant Gangotri in Suryodaya hotel. Guests can savour Indian, Gujarati, Marathi, South Indian, Chinese, Jain and Continental dishes at the hotel restaurant. I. Minimum 50% advance by Cheque/ DD in favour of “Hotel SURYODAYA” Payable at Haridwar at the time of reservation. Balance & all extras to be settled at the Hotel. II. 50% refund of the advance will be made if cancelled / postponed minimum 72 hours prior to reserved date. No refunds after the period. III. No refunds shall be made in full or part I for short stay. Unavailed facilities or part for any services not provided due to technical unused or other reason beyond our control. IV. If guests with prior reservations fail to show upto 1800 hrs. without any prior information, The Hotel shall be free to cancel the reservation he such event no refund will be made. By Rail : Haridwar has a railway station of its own, connected with all the major cities of India. Many trains coming from Delhi, Mumbai, Varanasi, Kolkata, etc halt here and bring in the large rush of visitors who come to take a bath in the waters of the holy Ganges. There are a large number of trains available for reaching Haridwar fom New Delhi, with the ones to Dehradun also making a stoppage here.